Sporting its iconic green surface, the gymnasium at St. Thomas Aquinas, Flatlands, was once again the site of the Msgr. King Basketball Tournament, played for the 49th time, Dec. 26-30, and featuring top boys’ varsity teams from New York City and beyond. 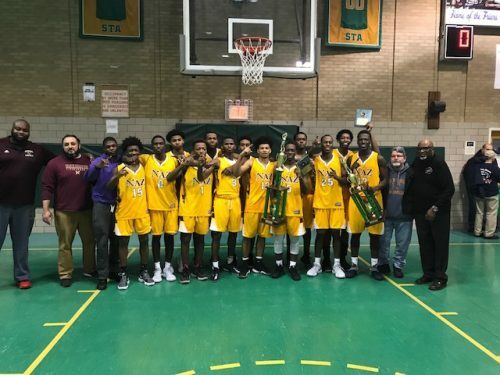 This year, the tournament title came back to the CHSAA, with Nazareth H.S., East Flatbush, winning the championship, 74-69, over Tampa Catholic H.S., Fla. The tournament is named after former St. Thomas Aquinas pastor Msgr. Jeremiah King, who in 1954 instituted a fundraising campaign to help underwrite the cost of three new parish buildings, one of which was the gymnasium. The first tournament was held in 1962 and honored Msgr. King, who was dedicated to the spiritual and physical well-being of the parish’s children. When it was founded, it was the first high school basketball tournament to be played at a grammar school gymnasium in the U.S. The girls’ tournament, set to take place Jan. 12-15, has been renamed in honor of Msgr. John Brown, the late pastor of St. Thomas Aquinas who died on March 3 at the age of 60 after a brief illness. Msgr. Brown was instrumental in restarting the Msgr. King Tournament in 2014 after a 10-year hiatus. Timi Faba of LIAM (Our Lady of Lourdes, Queens Village/Incarnation, Queens Village/American Martyrs, Bayside/Our Lady of the Snows, North Floral Park) broke the Junior 25-yd. Butterfly record with a time of 12.48. Matthew Beehler of STORM (Blessed Trinity, Breezy Point/Resurrection, Gerritsen Beach) broke his own Junior 50-yd. Backstroke record by more than a second at 27.77. Joe Brennan of VICAM (St. Virgilius/St. Camillus, Rockaway Park) broke the six-year-old Senior 50-yd. Breaststroke record by almost two seconds with a time of 28.86. Yousef Hafez of OLAN (Our Lady of Perpetual Help, Sunset Park/St. Andrew the Apostle, Bay Ridge) came in a close second and also turned in a record-breaking time. The Senior Relay team of AOK (St. Kevin, Flushing/St. Anastasia, Douglaston/Our Lady of the Blessed Sacrament, Bayside/Sacred Heart, Bayside) shattered the record by over two and a half seconds with a time of 1:37.73 in the 200-yd. Freestyle Relay. The team was made up of Jonathan Bonadio, William Chu, Joseph Espinal and Justin Schafer. Pedro Beato, a MLB relief pitcher who attended Xaverian H.S., Bay Ridge, signed a minor-league contract with the Philadelphia Phillies this offseason. Drafted by the Baltimore Orioles in 2006, Beato, who played his summer ball for the local Youth Service League, was selected by the New York Mets in the 2010 Rule 5 Draft. He spent parts of two seasons with the Mets before being traded to the Boston Red Sox in 2012. He has since appeared in games for the Atlanta Braves and Phillies. In 85 career games, the 30-year-old is 4-2 with a 4.31 ERA.